The previous post talked about the program that Ibn Qudāmah al-Maqdisī (d 620AH) put together for taking students with zero knowledge and, through gradual stages, turning them into mujtāhids. It’s a great idea. Most of the books on the program continue to be read up until today, either in their original form or through a derivative work. For example, take his second book: Al-Muqni‘. The book itself hasn’t been a major part of the Ḥanbalī curriculum for centuries – but we still read it today in the form of its abridgment Zād al-Mustaqni‘. One of the reasons that we no longer read these books directly is that the official position of the madhhab, the mu‘tamad, has changed a bit since his time. The madhhab’s development didn’t end with Ibn Qudāmah. (And how could it, given his program!) Soon after him, the madhhab had scholars like Majd al-Dīn Ibn Taymiyyah (d 652AH) (c.f. Al-Muḥarrar) and his grandson Taqiya al-Dīn Ibn Taymiyyah (d 728 AH) (the “Ibn Taymiyyah”) who exercised their ijtihād, which had to be fit into the overall corpus of the madhhab and assessed to see how the opinions stood with respect to the principles of the school. Ibn al-Mufliḥ (d 763AH) (c.f. Al-Furū‘) and, then ʿAlī al-Mārdāwī (d 885AH) did this for the whole madhhab in his Al-Inṣāf. So, the madhhab did not end with Ibn Qudāmah, and some opinions on rulings have changed. And soon enough, along comes ʿAlī al-Hajjāwī (d. 960 AH/1553 CE) who decides to abridge Ibn Qudāmah’s Al-Muqniʿ, sticking to the madhhab’s official position, removing extraneous issues, and adding a few necessary things. His book is known as Zād Al-Mustaqniʿ fī Ikhtiṣār al-Muqnīʿ. Al-Ḥajjāwī’s book is extremely terse, yet it still manages to give the core of the madhhab along with issues rarely found in books twice its length. Scholars of the madhhab accepted the book to such an extent that some said that whoever has memorized Al-Zād is fit to be a judge. One of the indicators that a book has been well-received is that people write commentaries on it and continue to do service to the book in some way. And that certain is the case for Zād al-Mustaqni‘. Its most famous commentary is probablyManṣūr al-Bahūtī’s (d 1051 AH) Al-Rawḍ al-Murbi‘, which adds explanations, evidence, legal causes [taʿlīl], and some additional rulings. This commentary itself is so well-received that it has its own meta-commentaries and marginalia. And Ẓād al-Mustaqni‘ has other commentaries. It even has contemporary commentaries, perhaps the most famous today being the late Ibn ‘Uthaymīn’s (d1431) Al-Sharḥ al-Mumti‘. Thus, even if Ḥanbalīs don’t read Al-Muqni‘ directly, they still read one of its derivatives – or one of its derivative’s derivatives. And one of those derivatives is Zād al-Mustaqni‘ which itself has a wide-range of commentaries explaining, clarifying, supporting, and expanding on the text. The author of its most popular commentary – Manṣūr al-Buhutī – wrote many other books, which makes it easy for a reader to verify and clarify what is intended in Al-Rawḍ al-Murbi‘. This is especially useful when someone needs to be able to figure out what al-Ḥajjāwī intended with enough clarity that he accurately convey that intended meaning via paraphrase or translation. While in Damascus, I had the opportunity to study Ḥanbalī fiqh with one of the madhhab’s authorized muftīs. I did as a supplement to my Shāfi‘ī studies – not a replacement. I started reading with the Shaykh towards the end of 2000. After a year of reading, the Shaykh suggested that I begin teaching and transmitting what I was studying with him. I was already translating several books related to the Shāfi‘ī madhhab, so I figured that I should do one for the Ḥanablī, too. At the time I couldn’t find mention of any Ḥanbalī books in English, so I figured that if I was going to do one, I had better to one that would be rock-solid and comprehensive and that it would be a major bonus if it had a lot of related literature to turn to in times of difficulty. With its brevity, strength, and the existence of Al-Rawḍ al-Murbiʿ with al-Buhūtī’s other works – Zād al-Mustaqniʿ was the obvious choice. I started work on at the end of June 2001 and three weeks later I had a complete first draft translation of the book. It was approximately 60,000 words long and in dire need of editing. I didn’t have an opportunity to do anything with the translation until 2002 when I used it for teaching a small set of students. From September 2002 through 6 September 2002, I used the text as I produced lessons covering all of the chapters of worship (including jihad), and the beginning of the book of marriage. Each lesson included the translation from Zād al-Mustaqni‘ with additional annotations from al-Buhūtī’s Al-Rawḍ al-Murbiʿ and Kashshāf al-Qināʿ, and from ‘Abd al-Qādir al-Taghlabī’s Nayl al-Ma’ārib; and comments based on my lesson notes and reading. I did what I could to make the text accessible and practical. These lessons were never mature enough to publish: they were full of typographical errors and, more importantly, translation mistakes. This is the primary reason that I never released the whole set of lessons or the translation to the general public. A second reason is that the lessons contained enough additional material and, even though the additions were clearly identified, it would no longer be accurate to claim them as a translation. A third reason is that, over time, I came to realize that a less advanced text would be of more benefit to English readers – something like Ibn Balbān’s Akhṣār al-Mukhtaṣarāt. Towards the end of 2012, Abu Eesa Niamatullah asked it I would allow him to use the translation in his Logical Progression class. He agreed to ensure that the students would be made aware of the mistakes and their correction (and eventually pass those corrections back to me), so I supplied him with everything I had: the complete translation along with my notes, from the author’s introduction all the way to the very end. Some 230 odd pages of material. The PDF I gave Abu Eesa has never ended up online. But other packets of the lessons do keep popping up online – with all the typos and mistakes intact, but with the copyright notice and author’s name removed. For several years, I figured that people were sharing it out of the lack of Ḥanbalī material in English and that they would stop once more material was around – and if I published something myself that would take its place. This Ramadan, I published Ḥanbal Acts of Worship, a first installment towards translating all of Ibn Balbān’s Akhṣar al-Mukhtaṣarāt (“The Supreme Synopsis”). Unfortunately, unauthorized versions continue to be placed online. They are full of mistakes. My mistakes. Even if I did the responsible thing by keeping them locked up – once they were published to the world, I still feel responsible for the inaccurate transmission of both the book and the madhhab. If a zoo keeps a lion in a cage, and some robber opens the cage – does the zoo not bear some responsibility for protecting people from the lion? unauthorized copy of Zād al-Mustani‘ that had been placed online. I figured that it was time for me to revise the Zād al-Mustaqniʿ portions corresponding to the lesson material that keeps getting put online. And that is how I spend my weekend: correcting its mistranslations and typos, stripping out the additional content that really did not belong, and making minor editorial adjustments. So now you have the answers to both questions asked in the title: Why do another Ḥanbalī fiqh book? And why do it now? 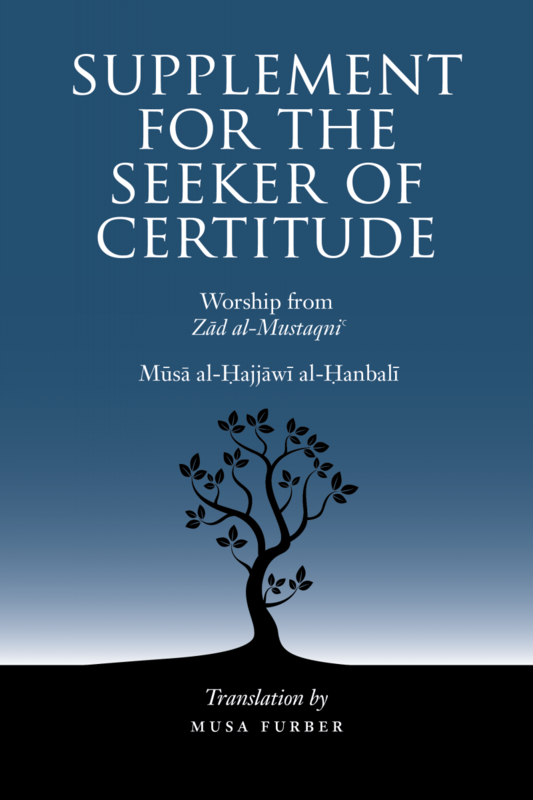 It is my hope that this translation from Supplement to the Seeker of Certitude – along with its future installments – serves English-speaking audiences as an introduction to intermediate-level Ḥanbalī fiqh. As with other technical texts, it really ought to be read with a qualified instructor. I do not consider it a replacement for Ḥanbalī Acts of Worship. Rather, I recommend that readers start with Ḥanbalī Acts of Worship first, and then read the more advanced Supplement to the Seeker of Certitude. May Allah reward the Imams, scholars, and students of the Ḥanbalīs – past, present, and future. May He grant all who have been mentioned here and in the previous article (and its readers!) His mercy, and may He make us among those who benefit from these texts. Where I have succeeded, it is only through the grace of Allah; where I have faltered it is from my shortcomings. May Allah forgive its author, its owner, its reader, its listeners, and all Muslims – living and dead. Get your copy of Supplement to the Seeker of Certitude now. Shukran for your kind words. It’s great to hear that the translation has been part of such a positive experience. And shukran for your generous investment in the book. Please let others know that it is available.